Are You Ready to Do The Twist? 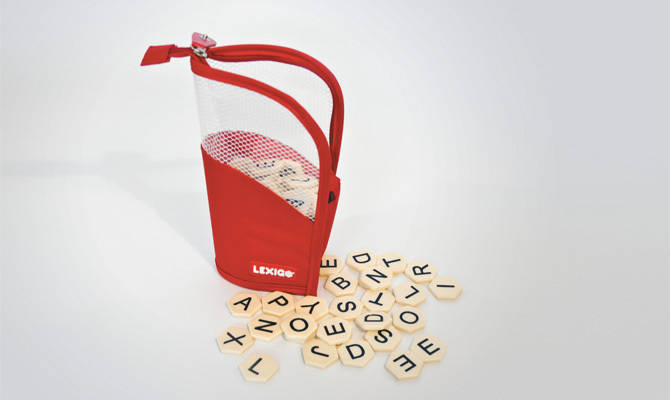 Get twisted with Lexigo, our challenging letter-tile game for word lovers. In Lexigo, players add letter tiles to a grid to spell out words. Words can be spelled in any direction‚ forwards, backwards or in a twisty loop. Your pawn shows where you’ve been‚ and where you’re going! On your turn, add letter tiles and use your pawn to spell out a word on the grid. But choose carefully! Your next word must begin with the letter your pawn ends up on. Strategize and create havoc for your opponents! If you choose a word path that bumps into another player’s pawn, you can move your opponent’s piece to any empty space. There’s no need for scoring‚ the first player to use up their tiles wins the game! The game features unique packaging, with 100 high-quality, hexagon-shaped plastic letter tiles and a zippered travel pouch. Play Lexigo at home or on the go! Q. I know that I can reuse letter tiles in a word path, but can I use the blank tile more than once in a word? A. Yes! If you do this, that blank tile must represent the same letter each time within your turn. On the next player’s turn, the same blank tile may be used to represent any letter. Q. I want to spell the word PULLED. Can I let my pawn hop in place on the letter L to use that tile twice? A. No. You can slide off a letter and back on the first letter, but you may not hop in place. For example, you can reuse the same letter E tile in the word REBEL. Q. Can you play a piece in the open space of the starting grid? If so, why is it left open? If not, why not? A. Yes, you may place a piece in the opening space of the starting grid. It is left open to provide more interesting word opportunities. Q. As letter tiles are played, do they have to touch two other tiles as they are placed on the grid or only at the conclusion of spelling the word? A. When your turn is over, all the letters you have placed on the grid must touch two other tiles. Q. Help! What if you still can’t make a word after moving to a new place on the grid? A. If you can’t make a word, you should move your pawn to a tile where you can make a word with the letters in your letter bank. Remember: for a valid move, you only need to add one tile from your letter bank. Keep in mind that if you’re unhappy with your letters, you have the option to trade in tiles. Q. How many tiles are there with the letter S on them? A. Here is Lexigo’s letter distribution.